How honoured I am to be shooting the wedding of one of my favourite photographers, and my lovely friend! I remember the day Lelania came to work, saying she had "met an awesome guy on the bus". On the night bus, no less, on her way home from a night out with her sister. Before saying what I was thinking (something along the lines of, "nobody meets an awesome guy on the night bus, Lelania! "), I stole a glance at her and stopped in my tracks. The woman was bubbling with excitement. I said nothing. Before long, we had all met Mike. Kind and funny, helpful, and a perfect match for our vibrant friend. The studio was a-buzz with gossip ("I think he's the one," "Oh, I always thought he was the one..."). And he was the one. Lelania and Mike and I road-tripped to the Township of Tiny, to do their cottage country engagement photos. In the dusky glow of summer, they walked in the woods near Mike's family cottage, making each other laugh, and holding hands like there was no one else in the world. Before dark, we went to the beach to soak in the summertime vibes of this small Ontario town. Gazing out at Georgian Bay, dipping their toes in the shore, and breathing in the feeling of the future. For Courtney and Joe's downtown Toronto engagement photos, we decided to meet at the gorgeous La Société in Yorkville. It was early, and the restaurant was quiet enough for them to enjoy an after-work drink together, and for me to skulk around gazing at the breathtaking stained glass ceiling, and spying on them through plants... Yes, that is part of my wonderful world of "couples photography". We walked down to U of T for more photos, and ended up having a most hilarious, yet romantic time. Laughing and whispering stories to one another amongst the age-old stone walls of Victoria College, I felt happy just being in the company of Joe and Courtney. Courtney and Joe, thank you, firstly, for introducing me to the phrase "hot breath"... My photo shoots will never be the same. Can't wait to photograph your Niagara wedding this weekend!! 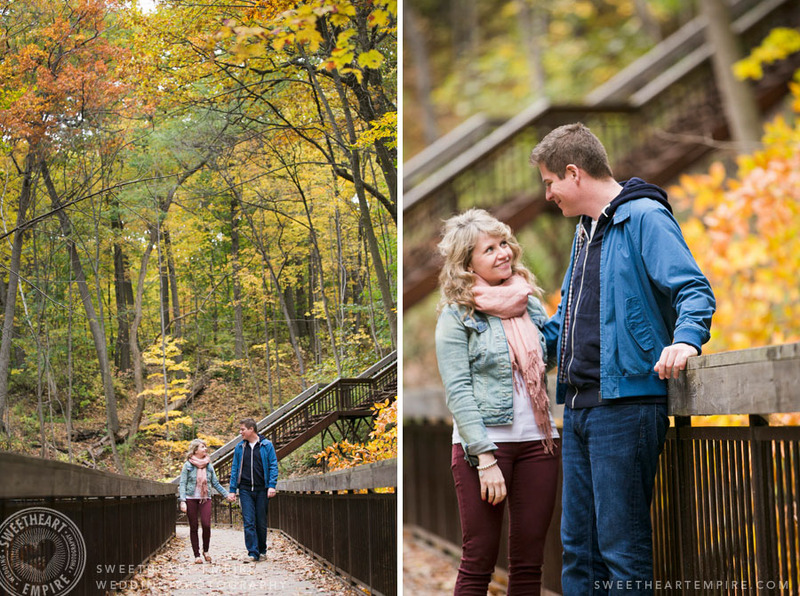 This engagement shoot was so much fun! I met Andrea years ago, when I first graduated university - I was the volunteer photographer for her organization, Endeavour Volunteer Consulting for Non-Profits. I can say that along side second shooting at weddings, Endeavour taught me how to be an event photographer... But enough about me! 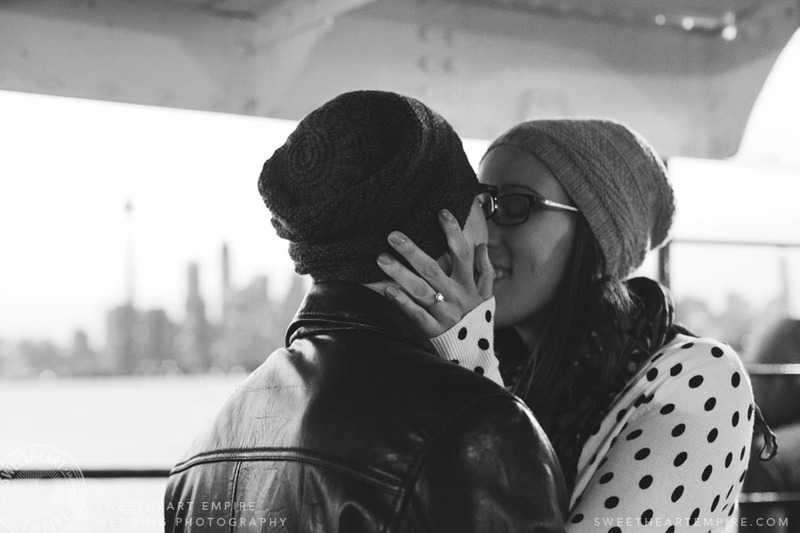 Andrea and Josh got engaged last year at Niagara falls, and I was thrilled to hear the news. They wanted to do their photos at Main Street Unionville, where they went for ice cream on their first date. Um... ROMANTIC. The light, the gorgeous greenery (I mean can you believe that bridge scene?!) and of course the secret and not-so-secret smiles between two people who have searched the world and found one another. Jeez, life is beautiful. 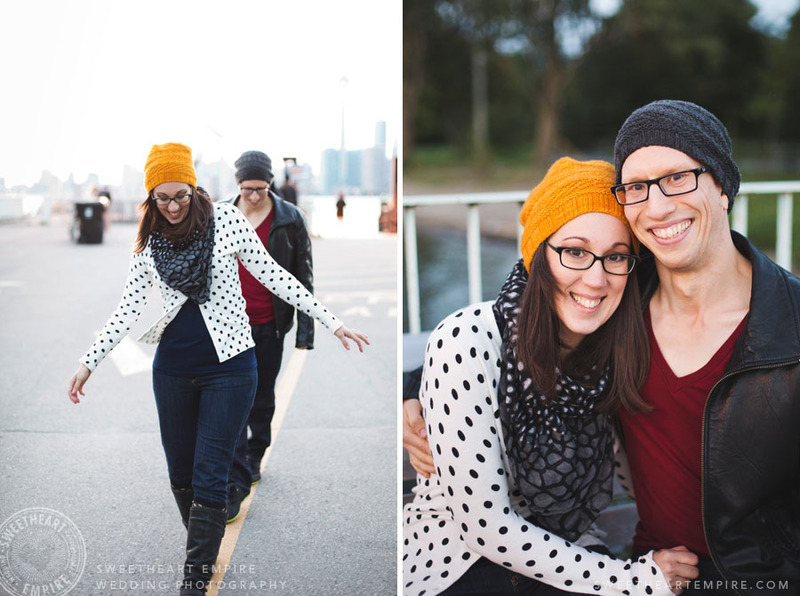 I am so happy to share Vanessa & Mark's Toronto Beaches engagement photos. I met this lovely couple when Vanessa was a bridesmaid in Kate & Ben's wedding, and was absolutely thrilled when I found out they were engaged. We decided to do engagement photos in their gorgeous neighbourhood, the Beach, in east Toronto. We started at Glen Stewart Park, near their house, and then went to take photos on the Beach of Ashbridges Bay. It was autumn, and the fall colours were breathtaking... But what was more beautiful was the connection between Mark and Vanessa. I want to say more, but I think the images speak for themselves. Vanessa & Mark walking through Glen Stewart Park, near their home in the Beach Neighbourhood. The fall colours at Glen Stewart Park. 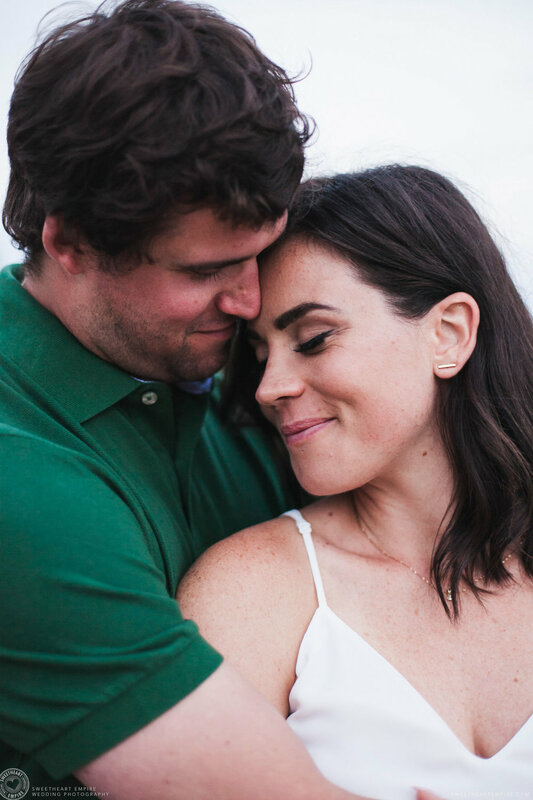 Engagement photos are the perfect way to take time out and enjoy one another during wedding planning. Vanessa & Mark strolling back to the boardwalk at the end of their Toronto Beach engagement session. Congratulations, Vanessa and Mark! I'm so honoured share the photos from your beautiful wedding at the Oakville Golf Club, as well! 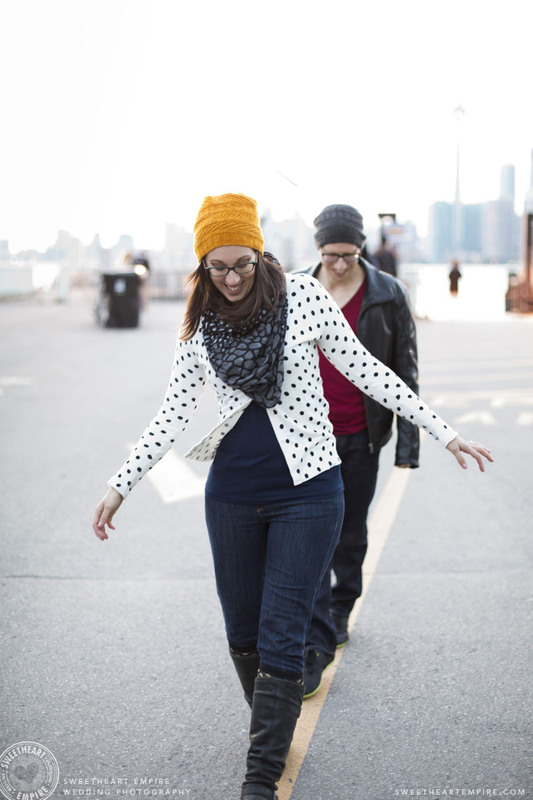 I love doing Toronto Island engagement photos... It's so magical over there ~ it doesn't even feel like you're in the city! I met up with Kerri & Jeff and we took the ferry over for a gorgeous afternoon last fall. We wandered about on both Ward Island and Algonquin Island, exploring the cottages, frolicking in the greenness-hippie-heaven, and enjoying the season's last rays of sunshine. At dusk it got windy so we stopped in at the Island Cafe for tea. I wandered off looking at the art pieces decorating the quirky, outdoor cafe, while Jeff and Kerri snuggled and giggled and kept one another warm. Fantastic day with fantastic people. Indeed! Jeff and Kerri, I am so glad that we connected, and am so happy to share the photos from your incredible book-themed wedding at the Toronto Reference Library!